Nilin is an Errorist, and she's going to hijack your Sensen to extract your Remembranes, with the help of her Pressens. No, you didn't enter a room full of disused perfume bottle labels, this is the world of Remember Me, a world where people can destroy any memory they wish, yet everybody chose to preserve the ability to talk total and utter guff. Remember Me is a game that is, to be quite fair, thoroughly up its own arse, a game where simplicity is dressed in shallow complexity, and meaning is an illusion created by carefully constructed gibberish. Strangely, though, it's not bad. It's infuriatingly full of itself, but there's fun to be had through the density of the smugness. It's the near future of 2084, and as per usual, an evil corporation has the world in its dominating grip. 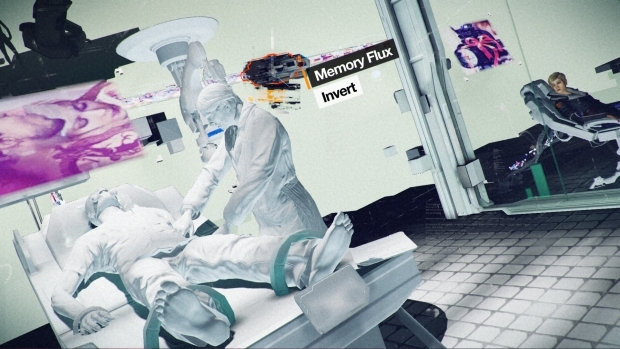 The culprit this time is MEMORIZE, a company that can implant, transfer, and extract memories, allowing people to live through others, and eliminate things that upset them. The whole world is addicted to it, but MEMORIZE is evil because of reasons and so terrorists -- sorry, Errorists -- are working to bring it down. Nilin is one such Errorist, a "Memory Hunter" with the power to "Remix" peoples' memories and alter their experiences. Her own memory stolen by MEMORIZE, she works with a mysterious benefactor named Edge to take the fight to the company, get her past back, and free the world from a soulless surveillance state. Remember Me's story is nonsense, a drawback hindered by the fact it throws armfuls of concepts at the audience at once without taking the time to detail any of them. The game's entire universe is literally explained to the player in a single rushed sentence, while characters are introduced, deliver plot twists, and leave the story in mere minutes. Supporting cast members are treated as important, their histories presented as emotionally affecting, without any effort being expelled in making the player actually care about them. What could have been a taught thriller instead becomes a collection of thinly fleshed ideas and a story that manages to say absolutely nothing while trying to tell us everything. This is to say nothing of Nilin's entire modus operandi being disturbing at best, with the ethics of her molesting peoples' minds never adequately called into question. Within moments of the game properly starting, Nilin performs one of her Remixes and does something legitimately disgusting, to a character whose villainous qualities were actually presented sympathetically. Her altering of somebody's memory in this first instance was appalling, and I spent the whole game waiting to see it come back and haunt her, yet it never did. One lame attempt to show the negative potential of Nilin's power occurs later in the story, but it's glossed over and does nothing to stop the Remixes continuing. 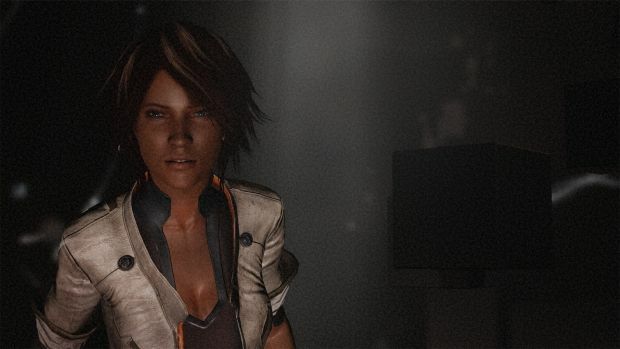 The protagonist is as bad as, if not worse, than many of the villains, and while that could have had serious storytelling potential, it's simply not addressed, while Nilin's actions are shown to be almost universally heroic. I found them immensely troubling. It's all nonsense, but it's stylish nonsense, at least. The real frustration in Remember Me's silly narrative is that the world it takes place in is a beautifully designed one, while individual scenes and setpieces are awe inspiring. The game knows how beautiful its Bladerunner inspired world is, and it takes the time to show you with sweeping camera angles and beautiful orchestral refrains. The visually busy environments are rich with detail and the bleak society, with its stark difference between the wealthy and the dejected areas, is evocative. This is one of those games where the surface-level presentation is so good it threatens to make you forget everything you've experienced up to that point as been total twaddle. It carries itself with such confidence you find yourself forgiving the made up words, the needling plot holes, and unchecked moral dubiousness of the protagonist. One may not like most of what Remember Me is saying (much of the dialog makes me actively cringe), but it's saying it so damn well one wants to like it. In this manner, developer Dontnod Entertainment achieves some form of twisted success. Such perversion carries over perfectly into the gameplay. Like the story, nothing can be simple or direct. 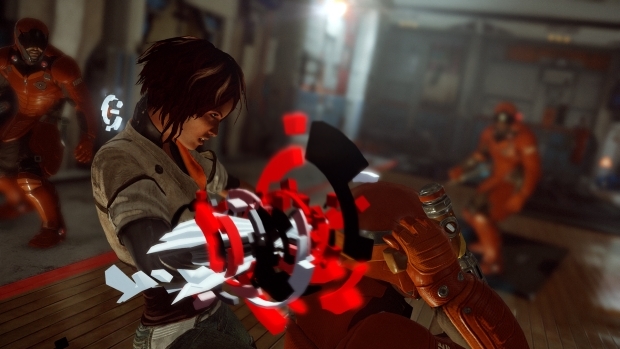 Nilin doesn't just fight with combo attacks, she uses Pressens. She doesn't have special abilities, she has S-Pressens. Never mind that they really are, when you boil them down, just regular attacks and special attacks. Remember Me's pomposity is such that even the simplest and most established videogame ideas are dressed in fine linens and sold to us as exotic mysteries from a New World. Combat invites players to "create" their own "combos" by entering the Combo Lab, a contrivance far more simplistic than first impressions indicate. 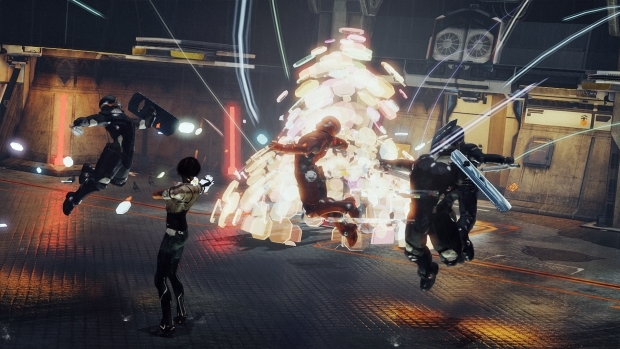 Nilin fights using simple kicks and punches, each bound to a single button. In the Combo Lab, you get to chain these attacks -- sorry, Pressens -- together by unlocking them and adding them to an attack chain. While you may think this gives you absolute freedom in what you chain together, it's worth nothing there are only four real combo strings in the game, and you don't get to choose what goes where. You can only select the type of punch or kick you deliver, not what you deliver or when. 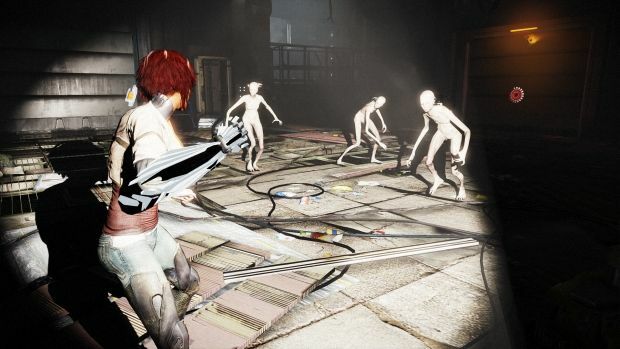 To keep it simple, let's look at the first attack chain Nilin acquires -- a standard three-punch combo, which on the Xbox 360 controller would be three taps of the X button. You never get to alter the fundamentals of this combo. It will always be three punches. One's choice comes in the three types of Pressens available -- ones that deal extra damage, ones that regain health, and ones that reduce the cooldown time on S-Pressen abilities. You can unlock these attacks through the course of the game, and mix and match their placement, but it's a very carefully controlled system, with linear unlocks and very little player agency. Your freedom comes in whether you want a certain punch to regain health or deal extra damage, but it will always be a punch. You can't alter the button presses or create any of your own attacks. The Combo Lab's sole purpose appears to be to make Remember Me simply look more engaging, rather than be more. At least it's thematically consistent. What this all amounts to is a combat system that takes several cues from the Batman: Arkham series, attempting to create free-flowing fights based on anticipating and avoiding enemy attacks before hitting back. Unfortunately, controls are a lot stiffer here, and the emphasis on chaining together long combos is frustrating thanks to the crowds of enemies, Nilin's perpetually confused auto-targeting, and combos breaking whenever she attacks the wrong opponent or dodges (the game preserves short combos when dodging, but not longer ones, I've found). What promises to be an engrossing and fluid system becomes a confusing one, full of an overabundance of visual information, ponderous combo chains that require too much concentration while trying to avoid opponents, and enemies that love to swarm around Nilin and take cheap pot shots. This is before she unlocks a ranged attack and starts fighting enemies that can only be hit with projectiles, who pile in among the melee-based fighters that keep getting in the way. This all sounds like a real downer, but sometimes, the convoluted mess of a scheme actually works. 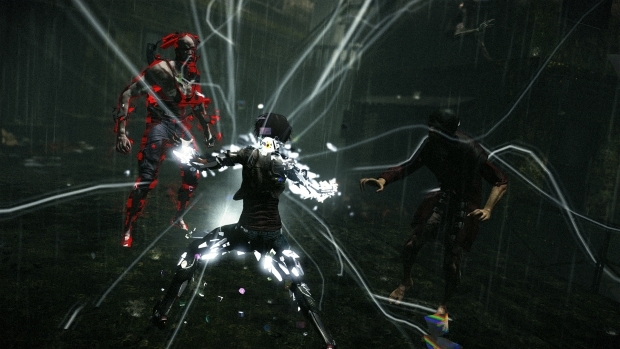 If you can nail the timing of a combo, and keep it timed amongst all the other crap the game's flinging at you, Remember Me achieves the sense of elegance it's desperate for, and the balancing of one's damaging and regenerative attacks is quite satisfying. Switching to a combo geared more toward health recuperation after taking a shot, before going back to the lethal moves is great when it all comes together. 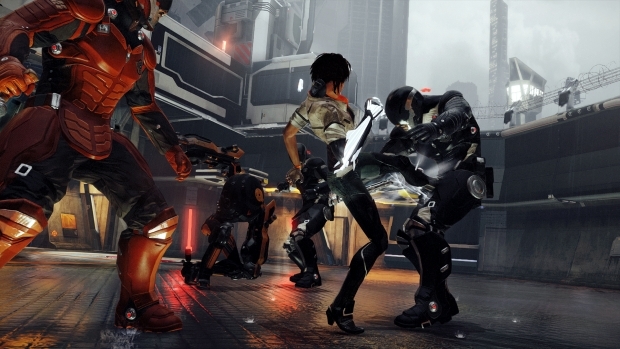 Getting the most out of the system requires one to accept that long combos will be rare treats, and that if Nilin decides to punch the wrong enemy, you're going to have to work with that rather than fight it. It requires an understanding that most of the visual information on the screen is bluster, and all that matters are red exclamation marks telling you to dodge. It requires knowing Nilin is not going to be the most responsive of characters, and compensating for that. Once one gets used to the unwieldiness, there's a lot of enjoyment to be had. It just takes a lot of getting used to, and over half the game could be over before it finally clicks for a player. The S-Pressens certainly help keep things amusing. Unlocked once Nilin delivers or receives enough damage, these visually impressive attacks have a range of effects, such as dealing lightning fast combos or stunning all enemies in an area. Later S-Pressens allow her to plant bombs on opponents or turn attack robots against their masters before self-destructing. A big part of combat is in utilizing cooldown Pressens to keep the S-Pressens flowing, which can be very rewarding. When she's not pummeling mutated Leapers or corporate enforcers, Nilin is climbing walls, shimmying along ledges, and generally clambering about to get from combat area to combat area. Her path is conveniently signposted so one can never really get lost, and the biggest threat players face during these sections is from twitchy controls that are often thrown into disarray by the camera, and see Nilin walk in fits and starts rather than take natural steps. She's not uncontrollable, and one eventually gets used to her jolting movements, but for at least the first few hours, I found her uncomfortable to utilize. Remember Me isn't a very challenging game, and it compensates in non-combat segments by trying to ambush the player with deathtraps. You may turn a corner and walk right into the path of a one-hit kill sentry drone, or suddenly leap onto an electrified walkway without warning. These moments aren't terribly frequent, but they do show up now and then just to introduce a little trial-and-error -- a problem made more aggravating by the lengthy checkpoint reload times. 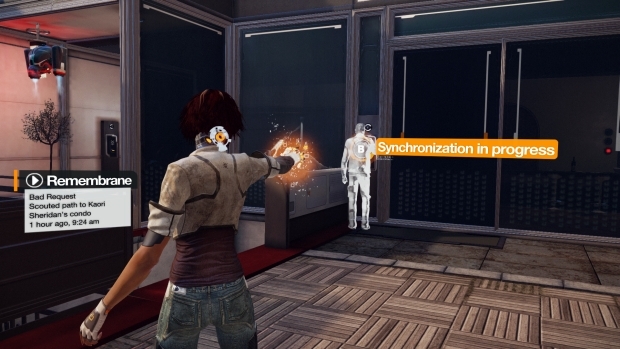 Nilin's skills as a Memory Hunter are put to use in a handful of ways, most notably the memory Remixing. At various predetermined points in the game, players are invited to invade a character's head and twist the way they remember certain events. The plan is to change defining moments in a person's life to alter their disposition, a tactic not treated with the horror it deserves. In terms of play, remixing involves watching a cutscene, then rewinding back through it to find exploitable glitches. For instance, one glitch may allow you to loosen the straps on a mental patient's gurney, or remove somebody's seatbelt in a car. Some of the glitches are red herrings, others lead to the wrong result. Finding the right environmental changes to obtain the desired outcome (for instance, making someone think a loved one was killed by a certain person) will change the way a person behaves. It's a clever idea that, like so much in this game, is more style than substance, given its linear nature and dull practicality. Way more could have been done with this idea, but like with the moral implications, Remember Me glosses over the concept. Elsewhere, our "hero" can steal memories and activate "Remembranes" to see a ghostly past version of a character and learn their secrets. Again, it's an interesting premise that, when put into practice, amounts to very little. In this case, you simply follow ghosts around several corridors while they mutter puzzle clues or lead you through dangerous territory. These sequences, like Remixing, are rather sluggish and tiresome. It's already been said in previews that Remember Me is more fun to watch than play, and that may be quite true. With its smooth animations, engaging art style, and delightful visual effects, not to mention the terrific soundtrack, this is a stunning thing to see in motion. 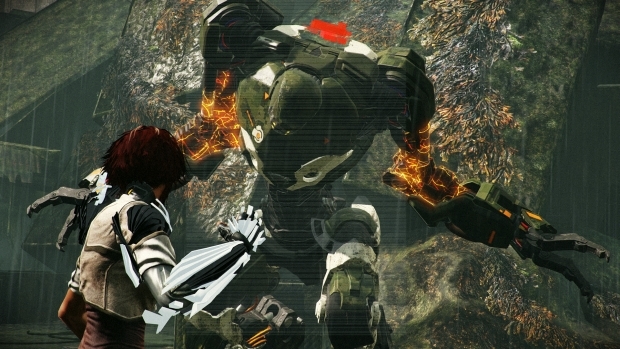 Combat in particular looks fluent and engaging, but it only looks that way. The hands dictating the action will receive a clunky and sloppy experience disconnected from the onscreen action. Likewise, memory remixes may appear fascinating at first glance, but to the player, it's a weary process of rewinding the same old cutscene to select predetermined objects. Remember Me is not a bad game, I must reinforce. It can be gratifying when it works, and overall it's worth giving a try for action fans or those looking for something that at least seems different from the usual glut of console titles. 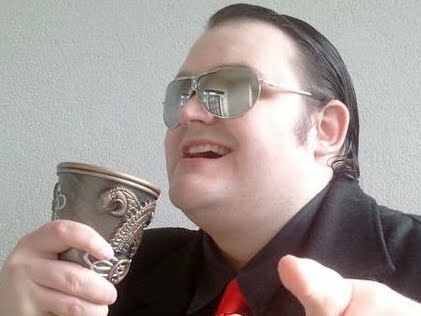 It is, however, a shallow game, one that masks its vapidity with fake words and new ways of delivering old concepts. It's one of those games possessed of a belief that simply having an idea is enough, without expending the effort required to do great things with the ideas in question. As a story, it's afraid to address the implications of its protagonist's deeds. As a game, it refuses to make its controls as elegant as its visuals. One has to applaud Remember Me's desire to be something more than the average videogame, but desire is worthless on its own. If it had spent more time actually being unique and interesting, rather than working so hard merely to look it, and if it had genuinely created a deep and compelling combat system as opposed to taking an old one and dressing it up as something different, we could indeed have had a brilliant game on our hands. As it stands, Remember Me is a game that offers about six to eight hours of disposable entertainment that defines pretentiousness and will be forgotten in an inconsequential passage of time.